It's great that the first three entries of the series are now available on current gen systems, but it's hard to ignore that the Devil May Cry HD Collection is essentially a re-release of a port of decade old games. Capcom’s Devil May Cry series has been thrilling gamers since 2001. The convoluted story of Dante, the son of the demon Sparda, and the rest of his twisted family has taken fans on a journey that began on the PlayStation 2, and has since stretched to current gen systems with 2015’s DmC: Devil May Cry, which itself is a port from the last generation of consoles. Now, Capcom has taken the first three games of the iconic franchise and once again packaged them in a hi-def collection for fans to once again revisit the beginnings of the story, in Devil May Cry HD Collection, now available on PlayStation 4, Xbox One, and PC. It’s important to know right off the bat that the Devil May Cry HD Collection is not a full scale remake or remaster. It is a direct port of 2012’s PS3/Xbox 360 collection, which takes the first three PlayStation 2 games and pushes them (begrudgingly) to 60fps. The presentations of all three games are still very much rooted in the early 2000s, with ugly, muddied cut scenes and 4:3 aspect ratios for the earliest games. If anything, playing Devil May Cry HD Collection is a good reminder of how far the industry has progressed, and where developers have come with newer technologies. It doesn’t mean that this collection — and these games individually — aren’t fun to play after 17 years, but don’t be fooled into thinking that there is anything new in this package. Devil May Cry HD Collection collects Devil May Cry, Devil May Cry 2, and Devil May Cry: Dante’s Awakening, and takes players on a hack-and-slash adventure that, at the time, was revolutionary. The trilogy is connected, but the story told across all three games is discombobulated. 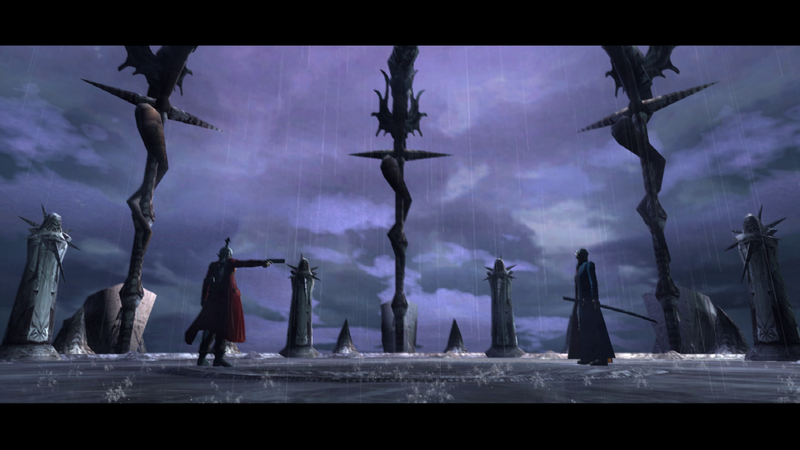 The earliest point of the story actually begins with the third game, and the first and second games round out Dante’s adventure. The collection allows players to start any game in any order, so the story can be played in true chronological order, or played as it original release order. 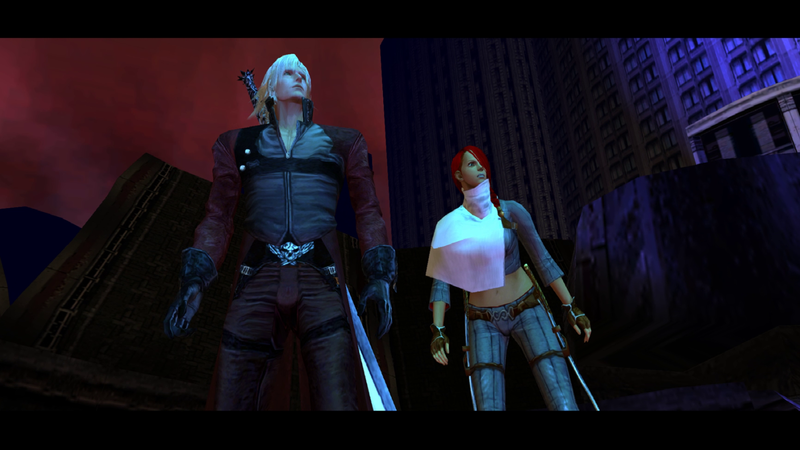 Dante and his collection of friends and family, some of which are playable, are armed with swords and guns, the legendary pistols Ebony and Ivory. Weapons and skills are upgraded throughout each adventure by collecting red soul spheres and using them to buy upgrades between missions or at designated areas within the game. The enemies range from various lower level demons to massive screen fillers based on legendary demons from various forms of literature. Devil May Cry has never shied away from a challenge, and the series still pushes the player to not only fight, but fight creatively for higher rankings. Almost everything is graded in this series, which leads to replaying missions for the S (or higher) rank. Even with the push to 60fps, the graphics in Devil May Cry HD Collection leave a lot to be desired. While they were cutting edge and gorgeous in the early part of the 2000s, now they look almost silly. Low poly meshes are evident in character and monster designs, and even by the third game, with its many advancements, the presentation is still very dated. To add insult to injury, the collection won’t take advantage of the more powerful PlayStation 4 Pro and Xbox One X, meaning that resolution will top out at 1080p, even if you’re using a high-end PC. Still, the action is faster than ever, and the progression from Devil May Cry to Dante’s Awakening is highlighted by the moves and skill sets that Dante and Vergil have in pulling off devastating sword and gunplay combos for higher scores and rankings. The Devil May Cry franchise also implements a fixed camera, which was made popular in the Resident Evil series. It was frustrating at first to go back to such an archaic game design, but muscle memory quickly took over, and I stopped noticing that I had no control of the camera and just pushed forward, slashing and shooting demons until my hands hurt — and they did. My old thumbs could barely keep up with the gameplay (I guess this is growing up). All three games also feature trophy and achievement support, and if you played the previous versions on last gen consoles, you can earn many of the same trophies again, if that’s your thing. Devil May Cry HD Collection is, at the very least, a nice reminder of what games were like nearly 20 years ago, and where they have come now. Capcom created a wonderfully dark and twisted adventure that has spanned 5+ games, and this series has a huge and rabid fanbase. And deservedly so. As a long time fan of the series, I would have liked to see a full remaster of the games, and I know I’m not alone. Devil May Cry has now become as legendary as its protagonist is gaming circles, and fans wait each year for word that Capcom will be bringing it back — not as a port of an older game or collection — but something brand new and thrilling. Devil May Cry HD Collection for PS4 and Xbox One could be the test to see if there is enough interest to revisit the series in the future. If so, I hope it passes. This review is based on the PlayStation 4 version of the game, which was provided to us by Capcom.